Plasma lipoproteins are aggregates varying in size from large chylomicrons to small HDL3. They are composed of complex combinations of apoproteins and lipids. 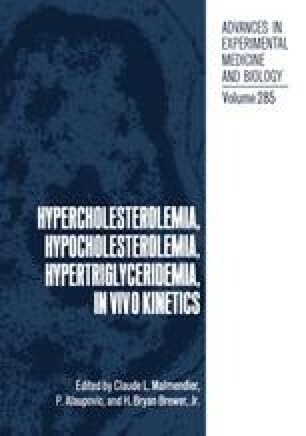 The triglyceride-rich lipoproteins, secret ed by the intestine as chylomicrons or by the liver as VLDL, contain a core which is rich in triacylglycerols. Small but varying amounts of cholesterol esters also are contained in the core. The surface lipids are extremely complex and include a variety of phospholipids, including phosphatidylcholines, phosphatidylethanolamines and sphingoelins, as well as glycosphingolipids such as cerebrosides and gangliosides. Also present in the surface is cholesterol and small but significant amounts of triacylglycerols and cholesterol esters. In addition the surface contains insoluble and non-exchangeable apolipoproteins, specifically B100 or B43, and exchangeable soluble apolipoproteins such as A-I, A-II, A-IV, C-I, C-II, C-III, and E. The determinants of triglyceride-rich lipoprotein composition are: 1) the metabolism of the cell that secretes the nascent chylomicron or VLDL, 2) the physical exchanges of lipids and apoproteins that occur in plasma, 3) the transfer proteins mediated exchange between core molecules such as triacylglycerols and cholesterol ester and surface molecules such as phospholipids, and 4) the action of lipolytic enzymes such as lipoprotein lipase, hepatic lipase and lecithin-cholesterol acyltransferase, to produce metabolically important lipid products including fatty acids, monoacylglycerols, diacylglycerols, and lysophosphatides.